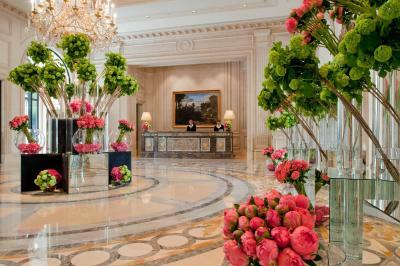 Lock in a great price for Four Seasons Hotel George V Paris – rated 9.3 by recent guests! We are traveling the world, stay in the best hotels and i have to say that this is the best hotel we have been to so far. The service is irreproachable. We have been there for my husbands birthday and with a new born and absolutely everything was perfect. I would like to thank again a amazing concierge team that have been just amazing and I would like to thank also the duty manager who was very lovely. Rooms and facilities are super, room service is amazing, super location but above all the service was unique. I loved that everyone at the hotel went out of there way to meet my requests. Responded very quickly whenever I would need anything. 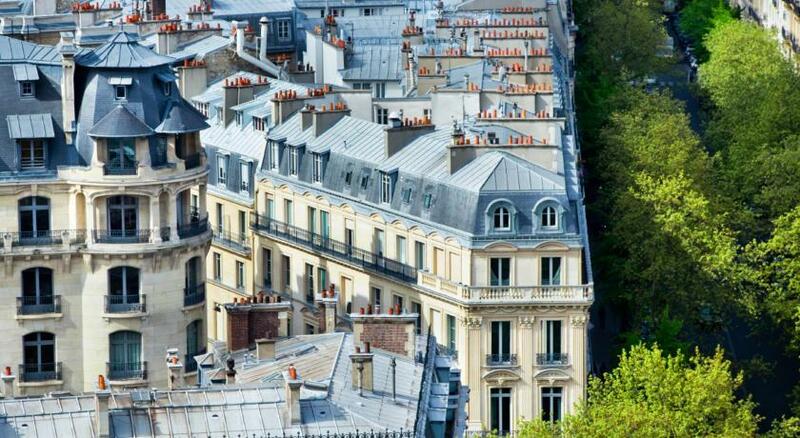 From booking a private tour at the Louvre, the Palacae of Versailles, and so much more. They exceeded my expectations. 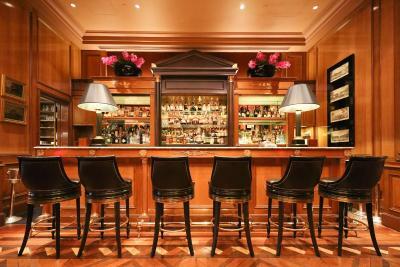 We were very much looking forward to staying in the George V and the decor is certainly beautiful. However, we were surprised by the service in the bar being very slow and left after 20 minutes to find somewhere else to have a drink. We asked several questions of the staff member who brought us to our rooms, which she said she would find out the answers for us. 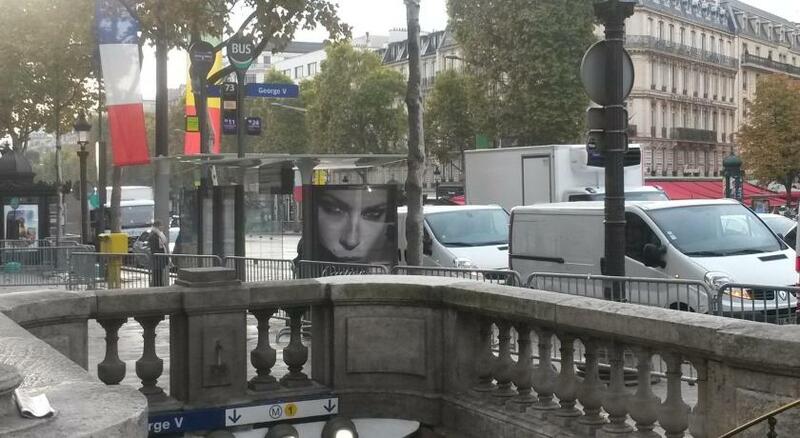 She didn't and did not contact us again. We were three people, and were given two bathrobes. When we requested another robe by telephone it did not arrive and we re-requested the following day which arrived promptly. The spa facilities were lovely and the pool very nice. The breakfast was not included. Overall, mainly positive but with some jarring notes. Professional,friendly, can’t do enough for you, staff & Hotel are exceptional, making our stay a highlight . Highly recommend . We stayed for weeks at the time in the 80s & 90s then we started liking the Bristol and stayed there since . My spouse insisted on Four Seasons this time . It’s very expensive but then again it’s special place . We were very happy from start to finish . 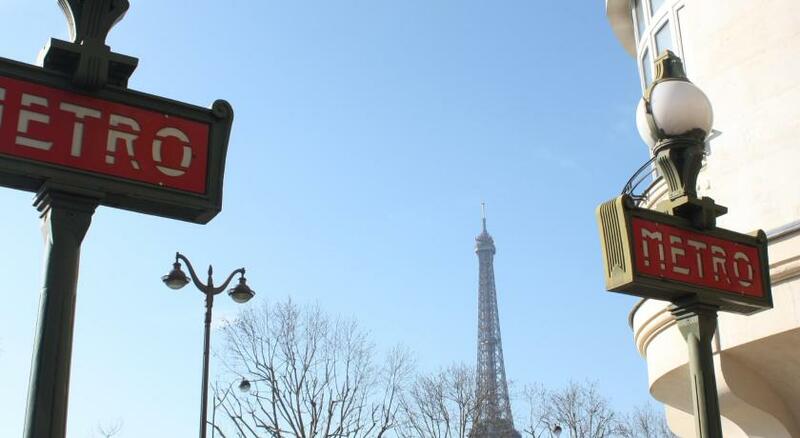 Room with a view of La Tour Eiffel! The bed was sensational! Large bathroom with a nice long counter for the two of us. Lovely coffee station and closet. Lovely house car. Obliging concierge. Wonderful in house restaurants. 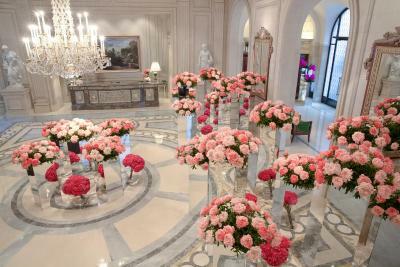 Gorgeous flowers! It was perfect really. The staff are superb —- from top to bottom. Friendly, professional and eager to please. Concierge staff in particular spent time with us understanding our restaurant preferences and guiding us perfectly. 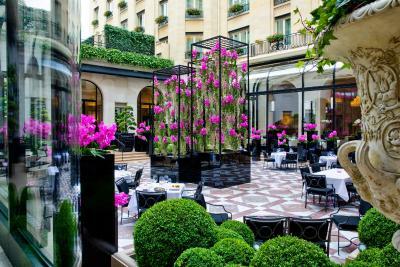 Four Seasons Hotel George V, Paris provides three restaurants recognized by the coveted Michelin Award for a total of 5 stars. 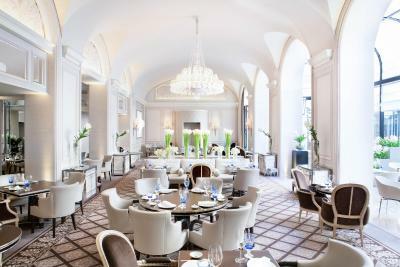 Classic French cuisine and lighter menus have earned Le Cinq restaurant three Michelin stars. 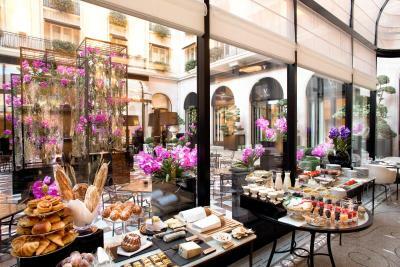 The chic La Galerie is a favorite spot among fashionable Parisians for a drink or light bite. Le George offers light Mediterranean cuisine designed for sharing. 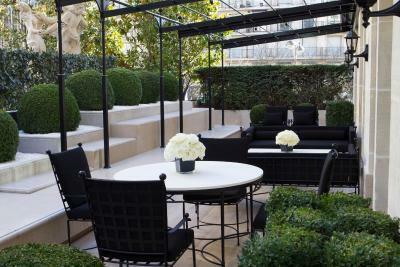 The 21 feet high conservatory offers views of the marble courtyard and houses the Orangerie Restaurant, where guests will be able to enjoy French Traditional cuisine with a contemporary touch. 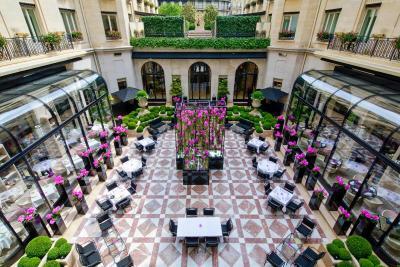 Both Le George and L'Orangerie has 1-Michelin star. Le Bar proposes cocktails and light meals and its large windows open on to the famous Avenue George V.
The spa, spread over 720 square yards, includes a 50 feet swimming pool, vitality pool with hydro-massage water experience circuit heated to 34°C, a 295 ft² cutting-edge fitness room, and a stylish hair salon. Moreover, other facilities include valet and concierge service, as well as meeting and banquet facilities with dedicated staff. 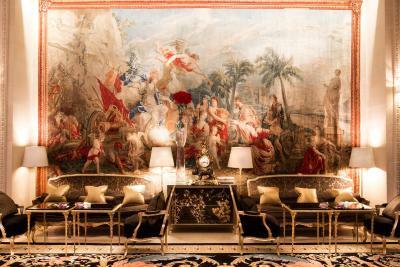 Just 1 mi from Eiffel Tower and 2.2 mi from Musée d'Orsay, Four Seasons Hotel George V Paris enjoys an ideal location in the Golden Triangle, famous for high-fashion boutiques. 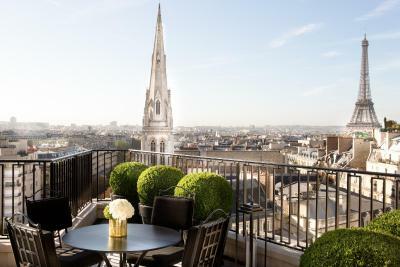 It is also 2.2 mi from the trendy shops and cafes of St. Germain-des-Prés. The hotel offers parking at an extra cost. 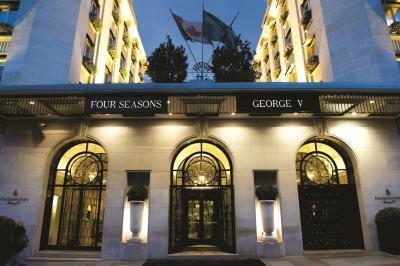 When would you like to stay at Four Seasons Hotel George V Paris? These superior Rooms offer peaceful views of the hotel's garden and marble courtyard, the whimsical West Garden or the bustling Avenue George V and Avenue Pierre 1er de Serbie. Public parking is available on site (reservation is not needed) and costs EUR 54 per day. 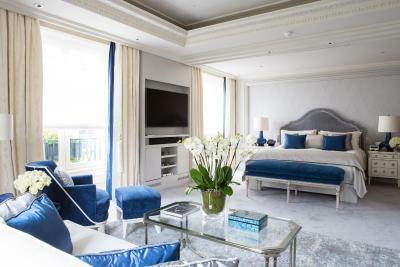 All of these airy, gracefully-furnished deluxe rooms feature crystal chandeliers and a marble bathroom with a relaxing, soaking tub and a separate shower. 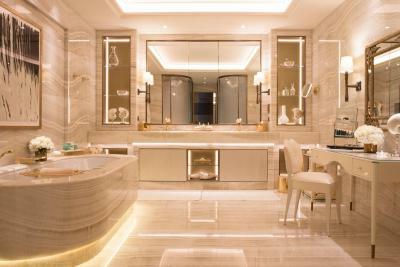 Extremely spacious Premier Rooms offer views of the Marble Courtyard and the Hotel's surrounding avenues. 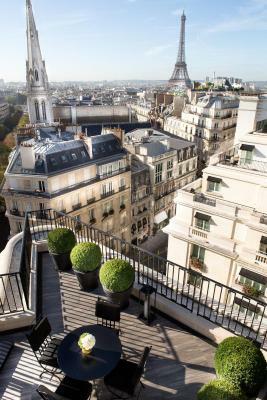 Large windows feature views of Avenue George V, the elegant Marble and Pierre 1er de Serbie courtyards and whimsical surrounding avenues. Gracious suites, with an entrance foyer leading to the large sitting room and the bedroom is secluded with sliding doors. 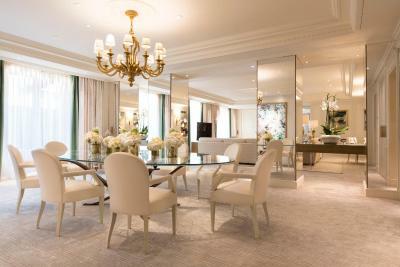 It features sparkling chandeliers and a generous sitting area outfitted with elegant antique furniture, a large work desk and all the modern amenities. 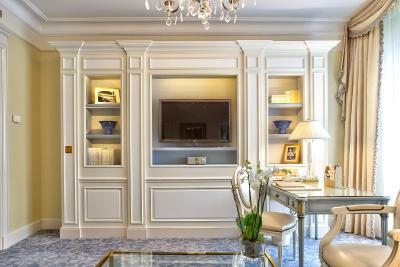 With the atmosphere of a Parisian apartment and graced with antiques and fine art, the deluxe suites offer a variety of city views. 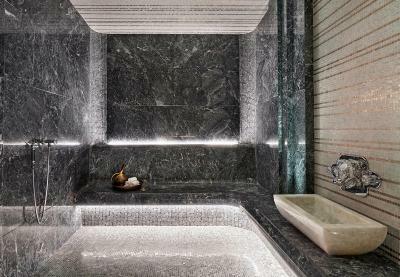 The lavish master bathroom is furnished with marble, a deep soaking tub and a separate shower. 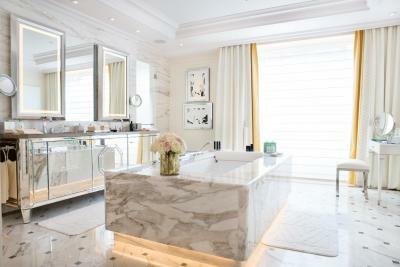 House Rules Four Seasons Hotel George V Paris takes special requests – add in the next step! Free! One child under 17 years stays free of charge in an extra bed. One older child or adult is charged EUR 250 per person per night in an extra bed. 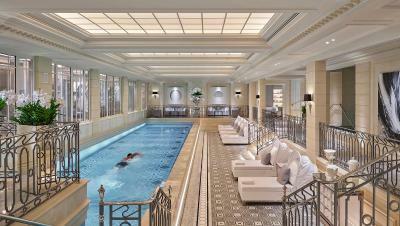 Four Seasons Hotel George V Paris accepts these cards and reserves the right to temporarily hold an amount prior to arrival. Please note that an American breakfast is also available and costs EUR 59. Room good. 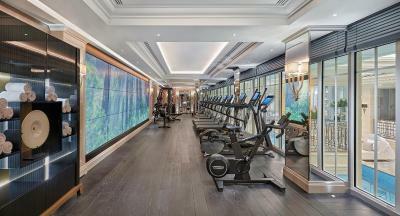 Fitness centre and Spa fantastic. The service was amazing. We felt very well looked after. Great cocktails too! Luxurious atmosphere of historic hotel. High level of service, client oriented personnel and hotel itself. Stylishly decorated halls and public areas with up-to-date ideas integrated into historic building. 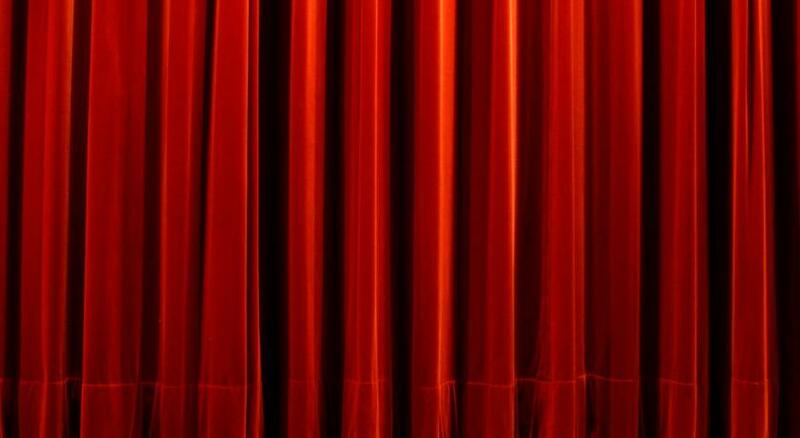 Calm and aristocratic performance in its' rooms. Very friendly and caring staff, ready to make your dreams of the perfect vacation true. Excellent rooms, make you feel precious and significant. Location, facilities, and more importantly the service was the best we have ever experienced. Impeccable. Particular mention to Miss Celine at front desk, she is a true testimony to excellent guest services.